The thermometer with microprocessor is a high precision 1-channel temperature gauge. The thermometer with microprocessor is ideal for use with various Pt100 sensors. BDue to the fact that it uses 4-wire technology has a very fast response time and precision. Therefore, the sensors of the thermometer with microprocessor are ideal for all processes that require precision and quick response. The temperature range of the thermometer with microprocessor reaches of -100 to +400 º C. The comprehensive software and easy to use thermometer with the microprocessor allows a simple assessment and see the values of a real-time measurement. The internal clock with date and time allows the user to accurately assign the results. 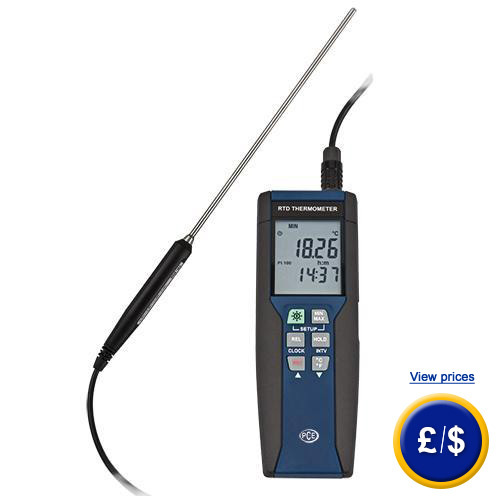 The thermometer has an internal data logger with adjustable measuring range. If you have any questions about the thermometer with microprocessor, see the technical data below or call us: UK customers +44(0) 23 809 870 30 / US customers +1-410-387-7703. Our engineers and technicians will be happy to advice you with the thermometers, and of course, on the other products in the field of regulation and control, measuring instruments and scales or balances. 0 ... 60 ºC, 80% R.H.
-10 ... 60 ºC, 80% R.H. Here is the software for the thermometer with microprocessor that is included in the delivery. This software allows you to transmit data from the thermometer with microprocessor PCE-TDL100 to your PC with the USB in real time, and view and store data. For companies that wish to integrate the thermometer with microprocessor in their internal quality control or that wish to calibrate it annually. The certificate according to ISO norms contains a calibration laboratory certificate including all measurement values. AInn the report the name and address of the company or person that requested it is also indicated. Network component for operating the microprocessor thermometer with direct current (230 V / 50 Hz). Ideal for long-term temperature records.